Need more proof that a Nexus 7 refresh is on its way? The deals are just flowing in. 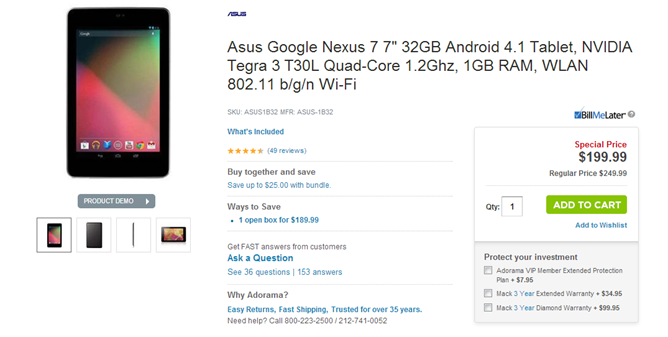 Adorama has knocked $50 off the price of a new 32 GB Nexus 7, bringing the beefier version of the tablet down to just $199. This price is part of a special email promotion, and it's quite lower than the $230 price point the tablet currently goes for at the site. The Nexus 7 may no longer be the peppy little device it used to be, but it's still a good deal for the money. If you're willing to forgo a new device for a lower price, a refurbished 32GB Nexus 7 is available on eBay for $20 less. Put down $179 and the device is yours. The device may not be new, but in all likelihood, it will deliver the same experience out of the box. If you really don't need the extra storage space, the refurbished 16GB Nexus 7s we mentioned earlier can still be had from eBay for just $150. It won't store as many games as the larger model, but it packs the same punch.